It has taken almost a decade of effort that included disputes with Apple, NBC and Steven Spielberg as well as an appeal to Kickstarter, but a New Hampshire man’s dream of relaunching the original science-fiction magazine is finally in print. “We had a lot of debate about that,” said Steve Davidson of the decision to make the reborn Amazing Stories a full-sized magazine on glossy paper rather than the smaller “digest” size, a format that dates back to the earliest days of pulp magazines. Either way, Davidson said the appearance of the 7,000-copy initial run – rolled out last month at the Hugo Awards, a science-fiction prize named after the man who started Amazing Stories in 1926 – has generated a lot of pleasure. “We got a lot of ego boost,” he added. Amazing Stories was founded by Hugo Gernsback, a New York publisher in 1926, and is considered the first science-fiction magazine. It thrived for decades but by the 1980s, it had died off. It briefly returned as a TV series in 1985 before disappearing entirely. 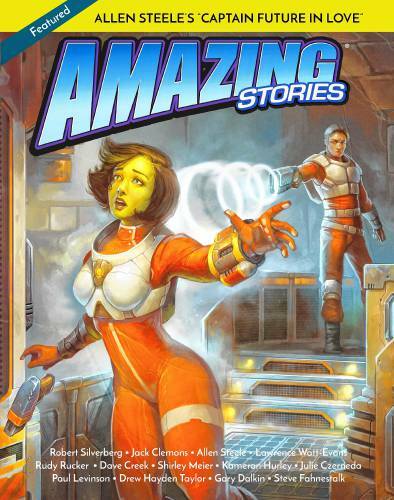 Davidson, who has lived in the state for years and whose late wife, Karen, was a New Hampshire native, bought the rights to the name Amazing Stories almost a decade ago after realizing that the trademark had lapsed. He turned it into an online publication in 2015 but his goal was always to bring it back to print alongside the three remaining SF magazines: Analog Science Fiction and Fact(which was originally called Astounding Stories of Super-Science), Asimov’s Science Fiction, and Fantasy and Science Fiction. All of those, incidentally, are digest sized. The project was delayed by personal tragedy when Karen died in 2017, and by disputes over the Amazing Stories trademark. NBC used the name for an anthology television program overseen by director Steven Spielberg in the mid-1980s and a few years ago had plans to resurrect the show before realizing that Davidson owned the name. Things got more complicated a year ago when Spielberg announced he had signed a deal with Apple to make a new Amazing Stories show. Legal debate ensued, as you might expect. Last year, tired of waiting for them to be resolved, Davidson took to Kickstarter, hoping that the science-fiction fandom would pony up to provide the money to get things going. “I finally got things settled with NBC, they paid me their initial fee, and that plus the 30K from the Kickstarter put us in the position to proceed,” he said Thursday. Although the relaunched Amazing Stories is a “slick” in industry terms, it’s not entirely slick-looking inside. The inside is all black-and-white, and most of the pages consist entirely of print in a relatively large font. What artwork exists is mostly drawings, not photos. This had the advantage of reducing costs. Davidson says printing costs about $7,000, while buying nine pieces of fiction, an author profile, a film review and a couple of essays cost about same at the industry rate of 6 cents a word, which he says is lower than it should be. There may be more interior color later if advertising picks up (the biggest advertiser in the inaugural issue appears to be Scholastic Press, which touts a novel on the back cover), but overall Davidson doesn’t object to the minimalist approach. “This is how it was in pulp magazines – line drawings, back and white. We don’t mind harkening back to that kind of look,” he said. There’s another thing about the magazine that harkens back to the genre’s past: Short stories. Back when Amazing Stories was first founded and for decades afterwards, short fiction, running from a few thousand to not much more than 20,000 words, was the main outlet for science fiction, fantasy and other parts of what is now called speculative fiction. “That’s where the genre came from. It wasn’t until the ’50s with the emergence of paperback publications that people began combining short stories or expanding them into a novel-length work,” he said. “Everything has gone to long novels and series these days … Hardly anybody doesn’t have two or three series (of novels) going,” Davidson said. At the Science Fiction Convention, he says, he urged a number of established writers to submit short stories for future publication. “Almost universally the answer was: I haven’t been writing short fiction for a long time, but I’ll think about it’,” he said. How well this works remains to be seen, but Davidson is optimistic. “Like the phonograph came back, vinyl records – we’re expecting print and short stories will come back, too,” he said.